If you’re wondering what’s up with these “is back” posts, especially since it hasn’t even been a year since FACT’s “debut” album, I’m just lazy. And I wanted to post this before anyone else. In the blink of an eye will be released in Japan on January 13 in both CD and CD+DVD+comic versions. The album was produced by Michael ‘Elvis’ Baskette and mastered by Ted Jenson just like their debut. No word on when Vagrant will release this in the US. The following is a sample clip from “Slip of the lip,” their new single that will be released digitally on December 16. I thought it would make more sense to move this to Mondays. Despite their matching green jumpsuits and goatees, chicken head maker is not a rap unit. Although they sometimes slip into reggae mode. 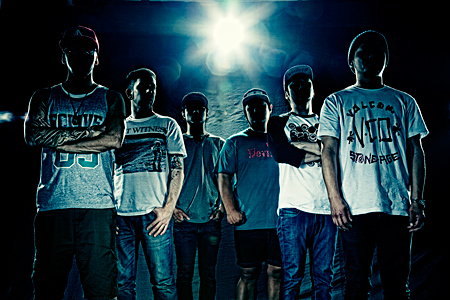 Chicken head maker formed in Tokyo in 2008 to play the pop punk song music. They have released one single Come Back To Me and have one mini-album coming out January 2010, both released by SouthBell Records. BUDDHISTSON will be having their 10th Anniversary showcase in their hometown of Kashiwa on December 5. They plan on playing over 30 songs. I’m surprised to hear they’ve been around that long, and that I’ve been listening to them for at least half of that. This is a band that has flew under the radar for far too long. Let’s get them more listeners for 2010. Since I have no plans to bring back Random J-Rock Updates, I decided to take something from it to make a weekly feature–myspace band of the week. Same rules apply. These are bands that don’t have much material or a PV to share, but have still impressed me with a song or two on myspace. You have given me your song and now here’s your sandwich. Alis del lotton ROY’ symphonica orchesto is a 3-piece “genre-less” band. If you’re wondering what their tongue-twister name is all about, Alis Del Lotton is the queen of their fantasy land and they are her royal symphony orchestra. Yeah, seriously. The lead singer/guitarist/cutie Momoko and pianist Yanigisawa have practiced classical piano since at least the age of 4, which plays a heavy component in their songs. Their music ranges from fuzzed-out acid trips to standard coffeehouse rock ala Norah Jones/Sara Bareilles. Their debut mini-album New Morning comes out November 25 via Theory&Practice Records. “Beautiful Stranger” is my jam. ELLEGARDEN fans are going to have to wait a little longer for their comeback album. The first EP from the HIATUS titled Insomnia will come out in Japan tomorrow. It features three new songs. The songs are a little darker than what we heard on Trash We’d Love, and feature more violins and heavier piano. The video above is for “Antibiotic,” an unprecedented ambient/electronic track from the band. Looks like Takeshi Hosomi was listening to too much Radiohead this time around. Back to our regularly scheduled program. This week we have eight new videos by eight bands. You’ll also find a poll at the very end. Thanks goes out to International Wota for the Halloween shoutout, making last week’s column the most viewed yet! You are currently browsing the J-Rock Explosion blog archives for November, 2009.